Posted March 30th, 2018 by Kim C. & filed under Alzheimer's, Assisted Living Services, Caregiver Assistance, Dementia, Dementia Care, Home Healthcare, Home Safety, Level of Care, Uncategorized. As your loved one, probably your parent, ages he or she may experience a decline in health independence. Whether it’s a physical compromise, cognitive, or a combination of both, living at home safely may be in jeopardy. And safely is the operative word. There is a cornucopia of reasons why someone needs assistance regularly. There is only one reason why someone needs to be relocated: safety! If the collective “you” are weighing providing at least 18 hours of in-home care versus an assisted living facility, please review these points, some of which you may not have considered. Also relevant is whether your parent is involved in the choice, as most prefer to remain in their own home. In fact, they may lobby diligently against moving away from familiar surroundings. By contrast, someone with compromising dementia is unreliable and needs decisions made for them, not with them. • Physical Needs. Whether in-home or in a center, your parent needs capable, dependable caregivers. The biggest challenge to in-home care is reliability. If the assigned caregiver doesn’t show up, who provides coverage? Extended family may have to be on call 24/7 to step in when paid caretakers aren’t available. If you’re still part of the sandwich generation, juggling a job along with your teenager’s soccer schedule, it can be impossible to add parental care too. Does your parent need special equipment? If so can the caregiver be trained to use it? By contrast, trusting a host of staff you don’t know with your loved one can be nerve-wracking. If mom/dad is lucid and articulate, ostensibly they can report about any poor behaviors. This assumes your parent is not chronically unhappy and/or experiencing dementia. • Costs. If you contract with an in-home agency, are the hours of coverage you need affordable? What a la cart extra fees apply? 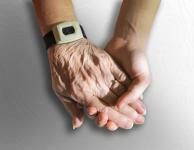 Long term care facilities are costly and mom/dad could outlive their money. Know the care facility’s policy should that happen. Are there situation-specific additional costs in either scenario? • Hidden Safety Concerns. Home throw rugs (my pet peeve and one I debated with my mother after my dad’s stroke) are a tripping hazard as are lengthy extension cords, etc. Just as new parents need to kid-proof their homes, so too do you need to parent-proof theirs. Will Mom bicker about every knick-knack and fragile “heirloom” compounding safe maneuvering in the house? Stairs also present safety hazards. All treacherous snow and ice has to be removed outside to the bare pavement in order to manage a wheelchair or walker. Replacing entry door locks intended to provide greater security can be difficult for some elderly adults to master. If they live alone some portion of each day, can they secure their house by closing drapes, locking the doors, turning on lights. Consider if your parent is vulnerable to telemarketers or other unscrupulous people intent on manipulating them for money or to cause them harm. Are their finances being managed appropriately if they can’t? Despite advances in on-line banking, most older parents are of an age where they probably prefer a paper checkbook. • Social interaction. In-home family and paid caregivers likely do not provide enough social interaction. It’s important to experience diversity, activities with friends and community events. Assisted Living facilities typically host daily activities and special events. By contrast if Dad’s into gin rummy he may enjoy it more with his friends/kids if they do pop over and stay long enough to play a hand or two. • Waiting List. Waiting lists for a care facility opening are a time abyss; it might be a day or a decade. Family circumstances vary considerably; no single plan works for everyone. Geographic proximity and willingness of family members to participate as well as finances are the biggest variables that interplay in making a long term care plan for one’s parent. My mother’s situation was dementia due to Alzheimer’s and she required 24-hour supervision. Since geographic proximity worked against us, we lived two hours apart, I opted to relocate her closer to me. It was the move from hell but it was necessary and inevitable. Relocation verses at-home care is a delicate and difficult decision at best. Consider the present options and your parent’s impending future needs and make the best decision you can with the information you have. If it has to be revisited at a later time, so be it. Just keep them safe from others and themselves. Elaine is the author of the Multi-Award Winning, Best Selling Memoir, I Will Never Forget. In it, author Elaine Pereira details the compelling story of her once brilliant mother’s journey through the dark abyss of dementia. I Will Never Forget won the prestigious National Indie Excellence Award, Aging Category in 2013 as well as 6 additional book awards. Elaine Pereira is a licensed Occupational Therapist. She graduated with a both her Bachelor’s and Master’s Degrees from Wayne State University. 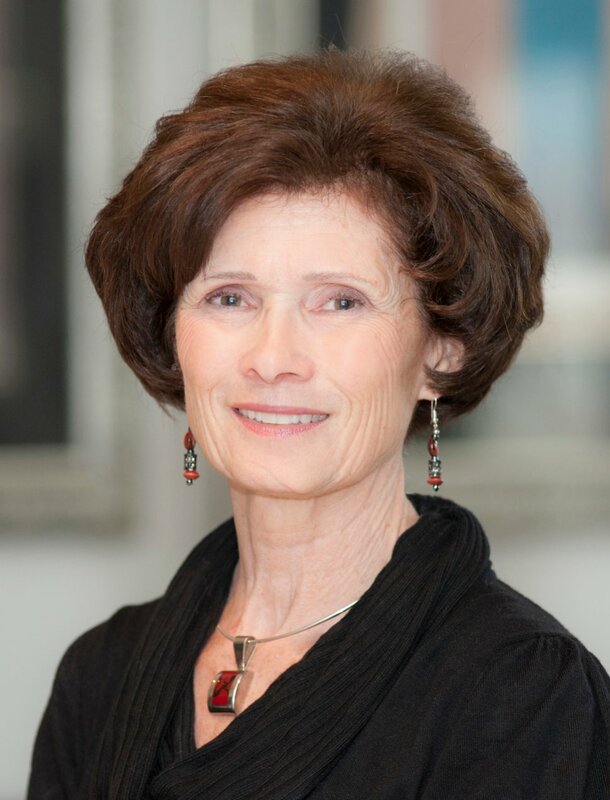 Additionally, she holds certificates as Certified Dementia Practitioner and Caregiver, CDP. CDC. 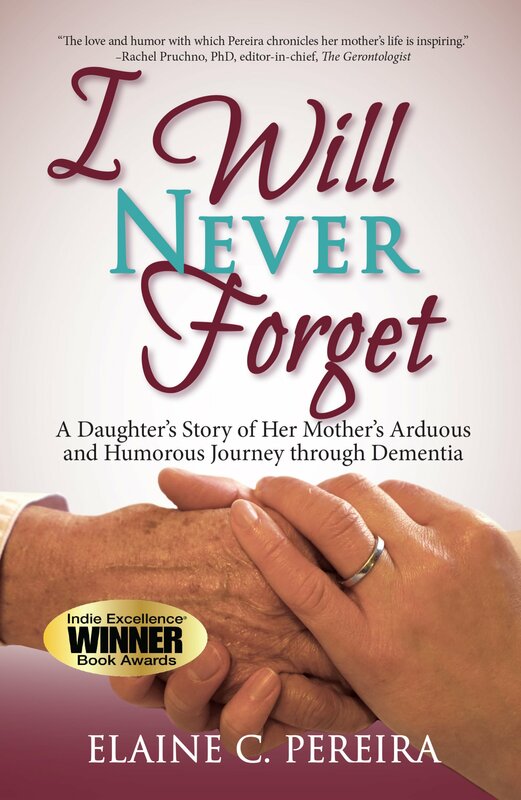 Pereira works now to help advance Alzheimer’s awareness especially through her Community Based and Professional Presentations as well as increase donations to research through sales of I Will Never Forget. Elaine and her husband Joseph live in southeastern Michigan with their furkids. Together they have five adult children and five wonderful grandchildren.